These CHILDREN Don’t get to eat everyday: SOme are so Underweight that their Brains and Bodies wint develop normally. The main deficiency is their weight, because these children don’t get to eat every day. He would use the BMI Index to classify the children as officially malnourished, which just means they are so skinny and underweight that their brains and bodies won’t develop normally. It’s really very dangerous for their (our) future. 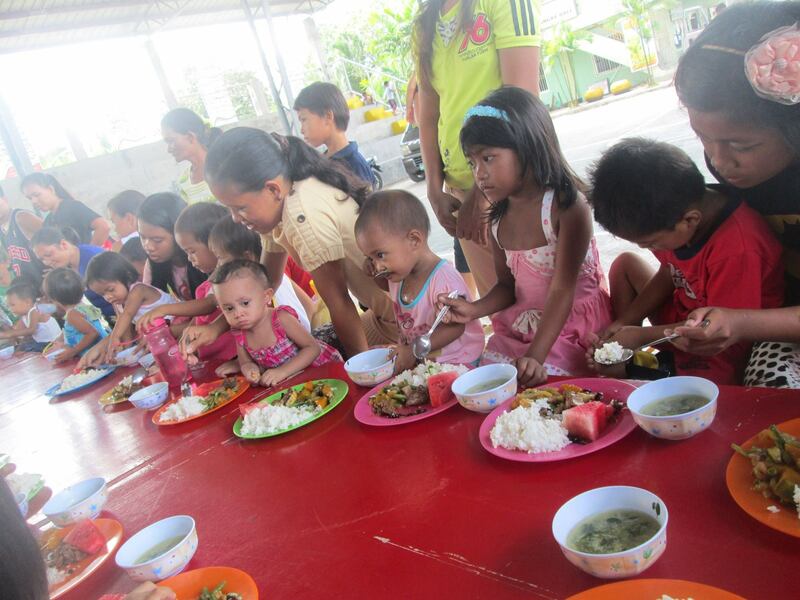 As an educator and retired chef, He seen a desperate need to provide food for these children. Mass feedings (250 kids at a time) are the simplest way to help. He started with two feedings a month, which I paid for out of his $350 USD/month from his teacher’s pension. As he feed the children, the Purok health care workers recorded their weight, which is thoroughly documented for their records and David’s. It was, and still is, immediately apparent that while these children have homes and family, they are woefully malnourished and dangerously underweight. For example, one 10-year-old girl barely made 16 kilos weight (35.2 pounds). He realized that to help them gain and maintain a healthy weight, they would have to eat everyday.